Editor-in-Chief of indiacommentary.com. Current Affairs analyst and political commentator. Writes for a number of publications. 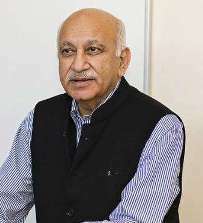 Serious sexual harassment allegations have been leveled against the minister of state in the ministry of external affairs, MJ Akbar by not one but two women, journalists Priya Ramani and writer Prerna Singh Bindra. According to both of them, Akbar is a chronic predator and many more allegations will surface against him. These charges are not ordinary and cannot be ignored. The minister must be made to resign pending inquiry. Akbar was a celebrated journalist who joined the Ananda Bazar Patrika group in Kolkata, first as editor of weekly Sunday and then started their English daily The Telegraph. He wrote a few books and owned/edited The Asian Age and The Sunday Guardian before joining politics, joining Congress and then shifting to the BJP. As conceptualizer/editor of The Telegraph, he was instrumental in smashing the monopoly of The Statesman in the city of Kolkata. But as stories are now being related by women, it seems Akbar was a habitual offender and behaving inappropriately with women, especially cub reporters, was second nature for him. He would often ask female reporters to meet him in his hotel room. He would proposition them and try to molest them. These are serious allegations. Sushma Swaraj just walked away when she was questioned about what steps the ministry was thinking of taking against Akbar. But this response will not do. The government must take action. Akbar must be asked to resign. Allegations must be probed by an independent body. If the allegations are found to be true, he must be punished as per the law of the land.